Calibe Thompson is the Editor at Large for TastetheIslandstv.com and the Executive Producer of public television's Caribbean cooking series "Taste the Islands". Together with her team, she identifies the most authentic Caribbean culinary and lifestyle information to share with the world outside the islands. Her company's mission is to share island-inspired content with a sophisticated, mainstream audience. Calibe Thompson's 50 Favorite Jamaican Recipes: Taste the Islands Essentials is the delightful product of the popular Taste the Islands PBS TV show. ‘Food on Fiyah’ is the motto of the show's culinary host, Hugh “chef Irie” Sinclair, and when you read through these recipes you’ll see why! The cookbook is divided into six sections, starting with Breakfast & Appetizers, Soups, Stews & Sauces, Poultry, Meats & Seafood, Sides, and Drinks and Desserts. A handy glossary is provided as well as a few tips to get you started. There’s also a list of annual Jamaican Culinary Events listed at the end of the book. 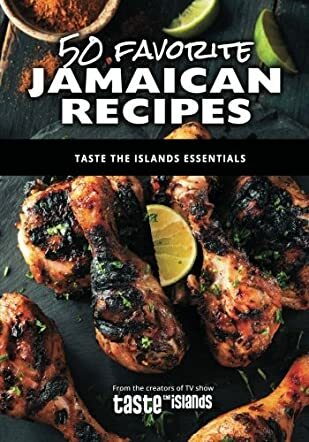 As a longtime cookbook collector, I’d say 50 Favorite Jamaican Recipes: Taste the Islands Essentials by Calibe Thompson is on par with the best of them, supplying several eye-catching photos (of food and sun-kissed islands) and recipes that will treat your taste for the tropics. If you’d like to add a little adventure to your cooking and spice to your life, these recipes will have you feeling Island Happy in no time. Recipes like Curry Chicken and Jamaican Beef Patties, which are staples of the Jamaican diet, to sweet breads and desserts such as Fried Dumplings and Spiced Bun. Almost every recipe has a picture, and each has an ingredient list (ones that are not so long they include everything but the kitchen sink), as well as clear instructions, and a short description which readers will appreciate. Taste the flavors of Jamaica, the food with Fiyah!